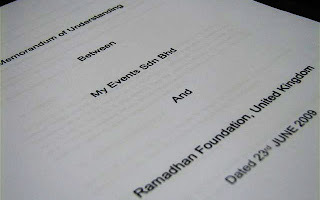 On 23rd June 2009 in Kuala Lumpur, Malaysia Ramadhan Foundation has appointed My Events International to manage and coordinate the 2nd International Muslim Unity Convention that will be held in Kuala Lumpur, Malaysia on the 14th – 16th December 2009. This was signed and ratified on the 23rd of June 2009, by the Chairman of Ramadhan Foundation, United Kingdom –Mr. Muhammad Umar & the Chief Executive Officer of My Events International, Malaysia – Mr. Shahul Hameed Shaik Dawood. Here is the link photos of the signing.